A very attractive haul this year from last weekend’s Chelsea Book Fair. Always a joy to visit, and I managed to bring away just about as many books as I could carry on both the Friday and the Saturday. Business all around seemed brisk – and footfall was considerably up on last year. Good to see all those friends, old and new, and so many smiling faces. Cataloguing the fresh acquisitions began well when I managed to include a reference to Dolores del Rio wearing this extraordinary outfit – a nice copy of Eric Ambler’s “Journey into Fear” (1940), a masterpiece of a spy thriller and a book I’ve not had a copy of since 2003. 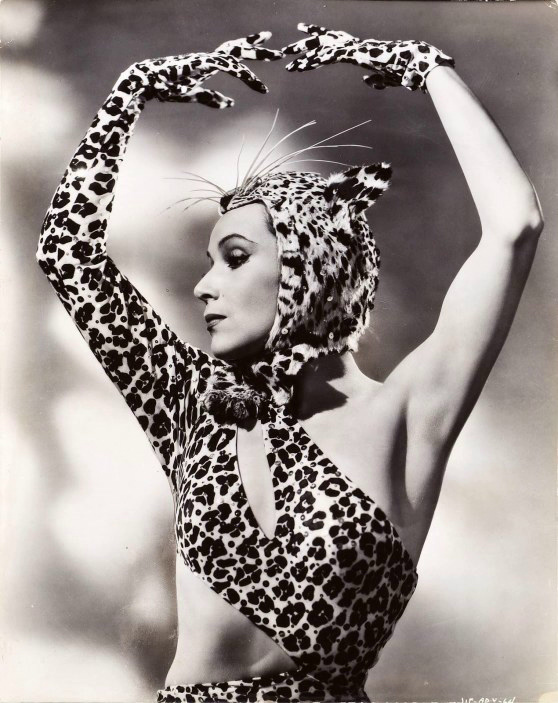 (Dolores del Rio played the exotic cabaret dancer in the 1943 Orson Welles movie version). 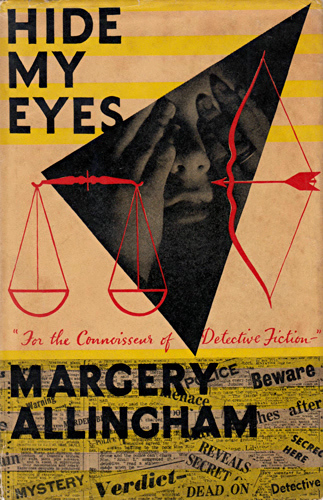 Then a copy of Margery Allingham’s “Hide My Eyes” (1958) – this copy descending from the family of the girl who appears in the photo on the dust-jacket (apparently Margery Allingham’s niece). 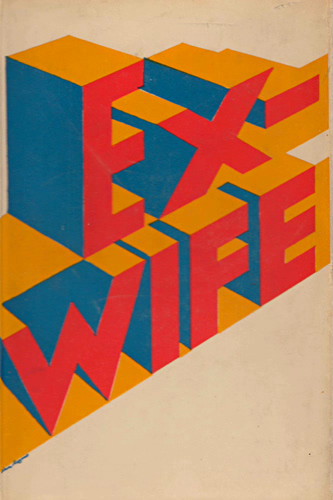 And on to dealing with this fabulous art-deco dust-jacket design by Alan Rogers for the British edition of Ursula Parrott’s very modern bright-young-things novel, “Ex-Wife” (1929), filmed the following year as “The Divorcee” – Norma Shearer took Best Actress at the Academy Awards. Does anyone know anything about Alan Rogers? He did a few posters for London Transport at about this time, but I don’t know what else. Otherwise, I can’t see how I can make a profit on this one – paid over the odds just for the joy of owning it for a while – but fingers-crossed I shall get my money back. (Do other booksellers do this? Probably not – at least not the successful ones). 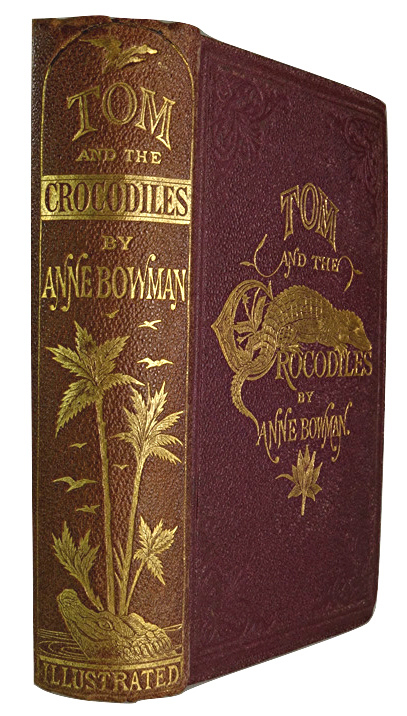 Lots of further fun to be had in cataloguing the rest, but I think my favourite so far (although by no means the most valuable) is “Tom and the Crocodiles” (dated 1867, but published late in 1866) by Anne Bowman (1796-1886). Not an author I’d come across before (at least I don’t think so), but she seems to have been just about the only woman writing these over-the-top and dramatically illustrated adventure stories – think Mayne Reid, R. M. Ballantyne and George Manville Fenn. “A new work, from the pen of Miss Anne Bowman, full of adventurous excitement and hair-breadth escapes from all kinds of peril. A family are shipped from London to a West India island, where they pass through a never-ending series of vicissitudes enough to daunt the energies of the strongest amongst the members of it. 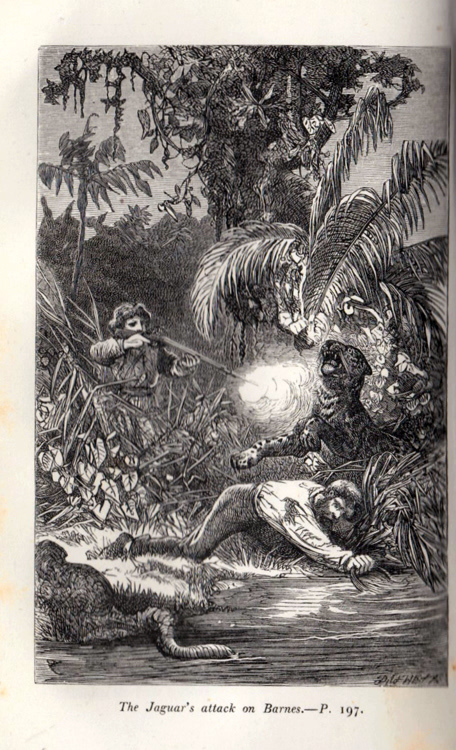 No one can complain of monotony who peruses these spirit-stirring pages” – a review of “Tom and the Crocodiles” when it first came out in November 1866 from “Bell’s Life in London and Sporting Chronicle”. What with shipwrecks, pirates, slavers, rapids, jaguars, panthers and native risings, not to mention the unremitting piety and platitudes of the mother, the crocodiles were probably the least of the Selwyn family’s worries. Anne Bowman was one of the early front-runners in this particular field. Mayne Reid’s first novel had appeared in 1850, Ballantyne’s first book for children came out in 1856, Manville Fenn’s later still. Her own, “Laura Temple. 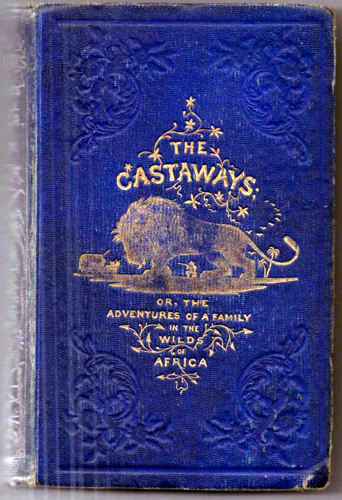 A Tale for the Young”, was published in 1852, soon to followed by “Travels of Rolando” (1853); “Esperanza; or, The Home of the Wanderers” (1855); “The Castaways” (1857); “The Young Exiles” (1858); “The Boy Voyagers” and “The Kangaroo Hunters” (both 1859); “The Bear-Hunters of the Rocky Mountains” (1860); “Among the Tartar Tents” (1861); “The Young Yachtsmen” (1864); “The Boy Foresters : A Tale of the Days of Robin Hood” (1867) and several more, finding time in between to produce other books including, inter alia, “Charade Dramas for the Drawing-Room” (1855); “Routledge’s New Reading Made Easy : A First Book of Lessons” (1855); “Poetry : Selected for the Use of Schools and Families” (1856); her own poems, “The Norman Invasion, and The Day of Rinrory” (1857); “The Common Things of Every-Day Life : A Book of Home Wisdom for Mothers and Daughters” (1857); the intriguing “How to Make the Best of It : A Domestic Tale for Young Ladies” (1861), and even “The New Cookery Book” (1867) – a book of “plump, well-stuffed, nicely-coloured, and tempting appearance, well suited to the subject”, according to the “Illustrated London News”. Her books do not seem to be particularly easy to find – at least not in decent condition – but they don’t appear to be particularly expensive either. For all her evident productivity and contemporary popularity, there seems to have been very little written about her, even by the specialists in children’s fiction. Not even her biographical dates seem to have been firmly established, library catalogues contenting themselves with the fairly self-evident, “Bowman, Anne, active 19th century”. In fact, she was originally a bookseller, and more than that, a bookseller’s daughter, coming to writing in mid-life with a fully developed eye for what sold and what didn’t. She may not have had the first-hand experience of adventure in foreign climes of a Reid or a Ballantyne, but she had lived among the inspiration and information on the shelves around her all her life. For those who want or need to know, she was born at Stanwick St. John in North Yorkshire in 1796, the eldest child of Thomas Bowman and his wife Ann Pulleine Johnston, who had married the previous year. Moving to nearby Richmond, her father built up a business from 1799 as a combination of bookseller, bookbinder, printer, stationer, owner of a circulating library, and music-seller – a business which passed to Anne Bowman and her younger brother, Thomas Johnston Bowman (1798-1871), in the 1830s. By 1851 they were employing five men, with their aged parents both still alive and living with them in Bank Yard. Ten years later, Thomas Johnston Bowman had joined his father in becoming a legal clerk, while Anne Bowman, on the back of her success as a writer, could list her occupation simply as that of a railway shareholder. She stopped writing in the late 1860s when she reached her seventies, but lived on for another twenty years or so, dying at Richmond aged ninety-one in July 1886. Laurence Worms has owned and run Ash Rare Books since 1971. He represented the antiquarian book trade on the (British) National Book Committee from 1993 to 2002 and has been six times an elected member of the Council of the Antiquarian Booksellers’ Association. He was largely responsible for drafting the Association’s Code of Good Practice first introduced in 1997 (and its recent update), served as Honorary Secretary of the Association from 1998 to 2001 and as President from 2011 to 2013. He is a former member of the Council of the Bibliographical Society and continues to serve on the Council of the London Topographical Society. He writes and lectures on various aspects of the history of the book and map trades, and has lectured at the universities of Cambridge, London, Reading and Sheffield, as well as at the Bibliographical Society, the Royal Geographical Society, the Warburg Institute, the National Library of Scotland and at Gresham College and Stationers' Hall. He teaches annually at the London Rare Book School, University of London. Published work includes the compilation of fourteen ‘lives’ for the “Oxford Dictionary of National Biography”, a number of articles for “The Oxford Companion to the Book” and the chapter on early English maps and atlases for the fourth volume of “The Cambridge History of the Book in Britain”. Essays on the British map trade are also appearing in “The History of Cartography” published by the University of Chicago Press. His long-awaited “British Map Engravers”, co-written with Ashley Baynton-Williams, was published to critical acclaim in 2011. He also contributed the numerous biographical notes to Peter Barber’s hugely successful “London : A History in Maps”, co-published by the British Library and the London Topographical Society in 2012. This entry was posted in Book Collecting, Book Fairs, Booksellers, Bookshops, Dust-Jackets, Forgotten Authors and tagged Alan Rogers, Anne Bowman, Chelsea Book Fair, Dolores del Rio, Richmond, Yorkshire. Bookmark the permalink. Nice little haul of books. Which are you most excited to read first? Already made a start on both of the first two mentioned.